Oriem is the abbreviation for OxiRane Innovation Encapsulation Material.It’s the Cape Technology’s affiliated company which was established and started operation in year 2002. 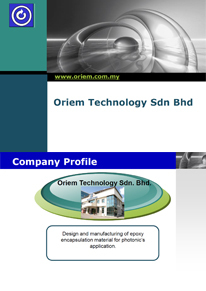 The initial operation of Oriem Technology focused on R & D and manufacturing of epoxy based encapsulant materials for the Optoelectronics industries. Both the companies are located at the Bayan Lepas Free Industrial Estate , Penang.